CSEA City of Long Beach, beach maintenance employees and workers from H & L Contracting take a break. 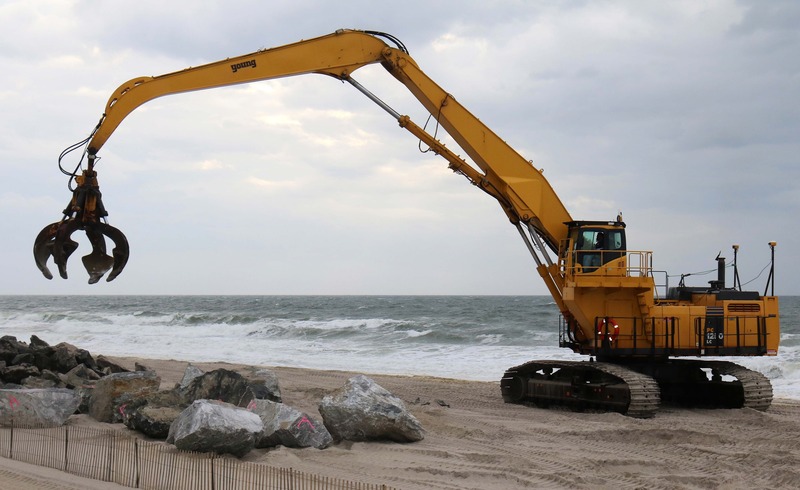 LONG BEACH — CSEA members are playing an important role in preventing future flooding and erosion from devastating the City of Long Beach, as it did during Superstorm Sandy. While a private contractor, hired by the United States Army Corp. of Engineers, builds 15 jetties from Azores Beach to Nevada Beach, our members employed by the city are lending a helping hand by keeping the terrain clean and level, which helps the project to progress without disturbance. The Long Beach jetties are stone structures that help contain sand on the beach. In addition to making sure the sand on the beach is level, our members must continue to fulfill their normal, daily work responsibilities. According to O’Neill, the project will continue for the next five to six months, which can include long work hours. Our members are working in conjunction with five additional unions on the jetties project. Professionalism on all sides has made the project advance seamlessly. “There’s no way we could’ve done that amount of work, in addition to maintaining the beach for the jetties if the contractor, Sean and [other city workers]weren’t willing to accommodate our work schedule,” said Canner. Even after the jetties are completed, CSEA members’ work will be far from over. The dunes will act as a barrier to protect inland areas from the impact of high winds and waves. CSEA members are happy to help expand on one of Long Beach’s most popular sources of recreation. “We’re trying to give residents a bigger and better beach,” said O’Neill.